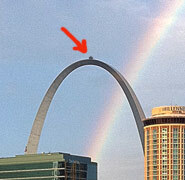 Casual Labs is a small game studio located in St. Louis on top of the arch, exactly in the middle. Edward Brown works at Casual Labs. When it’s time to go home, he slides down the arch.